It was cold and eerie. The sky had a strange grey pall over it. His thickly padded suit protected Sumanth, but his eyes were finding it difficult to adjust to the strange environment. 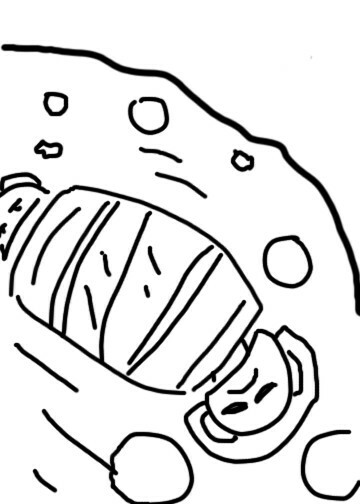 He stumbled over a moon rock and fell into a small crater. Bouncing out of it onto more solid ground – which was actually an endless carpet of grey dust – all of a sudden Sumanth realized that he was alone. He had lost his way, and there was no landmark that he could recognize. The vast expanse of bleak land pockmarked with craters and rocks, big and small, was silent, ghostly. He thought he could hear a faint hum somewhere, but soon recalled that the rarefied air made it impossible to hear, let alone locate the source or direction of the sound. Sumanth was panicking now. His children too were lost on the moon! The barrel on the moon. He tried using the speaking tube, but it dangled at a dangerous angle from his helmet and refused to obey his commands. He wanted to call the moon ship and ask his friend to look for Debie and Sambie. Debie had a sound head on her shoulders, but Sambie was forever launching into exploratory expeditions. He scented mystery where there was none. He would go haring down playgrounds and hotel buildings alike, chasing imaginary beings, his sister hot on his heels trying to keep up with him. Sumanth was sure Sambie had scurried off now as well. The boy just wasn’t born to obey. He regretted bringing the kids along, but it was a birthday promise he had had to keep. Sumanth had made his wife a party to this silly moonwalking trip, and now the children had wandered off in a different direction. He hoped the two were at least together. If only he could figure out where he stood and how far he was from the moon ship, he might be able to join his wife and his friend. His wife was mapping the area around the landing pad. His friend was manning the controls and was in constant touch with the tour organizers back on earth. He took out his moonometer and peered into the glass surface. Fine particles had formed a layer which he tried to wipe, but his thick gloves smeared it with more moon dust. It was a frustrating exercise. His anxiety levels were rising, and the pressure valve in his helmet was beeping so loudly that he could hardly think. He pressed his chest hard to calm himself. That set off an unexpected alarm, a sort of hoot. He had forgotten the embedded device, meant to signal to fellow tourists to converge. He sounded the hoot again, hoping the children would come scampering from over the horizon. He looked that way. God, no, not over the horizon. That was the dark side of the moon. Sumanth prayed fervently that Sambie had not been foolish enough to lead Debie there. No one had been able to fathom what went on there, for no light worked once you crossed the horizon and all missions to that part so far had failed miserably. Sumanth rolled down a huge crater, having missed seeing it because he was deeply worried about his kids. A big barrel lay at the bottom. Left behind by some moon tourists, he assumed. Still, he rolled it over lightly and stood back in surprise as it bounced upward to the other edge of the crater. He watched bemused as it started lumbering back in slow motion. Out peeped his son’s head! “Sambie!” he squeaked in relief. “Sambie, what are you doing here?” he fumbled with his speaking tube. Clearly his son could not hear him. The helmet on Sambie’s head was greyed over with moon dust, and it was difficult to make out Sambie’s expression. Where could Debie be hiding? Not in the same barrel, surely? Of course, there she was, her head popping out from the other end of the hollow barrel now. They seemed to be stuck. Their thick suits must have got entangled somehow, and now the kids were unable to wriggle out, he realized. Giving chase, he bounded down the crater but overshot the barrel by a huge margin. But he had underestimated the moon. With Debie and Sambie inside, the barrel hit the bottom of the crater and sped past him back to the huge open space above him. He braked hard, which meant he had to dig his thick moon shoes deep into the dust, and got blinded by it. By the time he cleaned his visor enough for some light to come through, the barrel had sailed over the edge and was out of sight. Sumanth clambered up gingerly, not wanting to slide back into the big hole. It was not easy to take big strides on the moon’s surface, and this slope made it even tougher. When he gained the edge, he found his two children flailing their arms and trying to exit the rolling monster. He swore he was not taking them for a moonwalk again. Again he overshot the barrel because he ran too fast and rose too high in the moon air. The dust he had kicked up down there created a spooky cloud in the background, against which his children in the barrel formed a grotesque silhouette. He landed with a soft thump, more dust rose, and a lump formed in his throat. At this rate he would not be able to rescue his children. He stood still, and motioned to them to stop struggling. Nerves somewhat steadier, he took measured little leaps that brought him close to the barrel. Catching hold of Debie’s moon suit, he tried to pull her out. But the harder he tugged at her, the more she seemed to resist it. “Papa, Papa!” Sumanth heard her cry. He tried to pull with all his might, and landed on his back. He had crashlanded – on the floor of his bedroom. His children were laughing heartily, having watched him struggle in his sleep to pull a bolster pillow from his wife’s hands. “Oh, so there you are,” he said as he lay splayed helpless on the rug. He smiled dreamily to himself. He had extricated them from that awful barrel at last. Thanks, Preeti. The book may be a long time coming, I'm afraid!